When Frodo put on the One Ring, both the Nazgul and Sauron himself found Frodo. However when Bilbo had the ring and possibly used it many times, Sauron sought Gollum to get a hint on where to look for the ring and send the Nazgul after it. Sauron sought Gollum before Bilbo wore the ring at his birthday party, slightly after that time, he was very effective at locating Frodo when Frodo put on the ring. So I guess it's not a matter of Sauron gaining any extra powers with time. Also Bilbo seemed to use the ring without it bothering him at any point, unlike Frodo who seemed to be very troubled when using the ring. How is that possible? Sauron doesn't find Frodo when he puts on the Ring. In the House of Tom Bombadil: Sauron doesn't find Frodo. In the Prancing Pony: Sauron doesn't find Frodo. On Weathertop: Sauron doesn't find Frodo, but Frodo puts the Ring on in the presence of the Nazgul who are then able to physically harm him. On Amon Hen: Sauron doesn't find Frodo; Frodo's gaze is drawn towards Barad-dur, Frodo feels the Eye, and only at that point does Sauron become aware of Frodo. At the Breaking of the Fellowship: Sauron doesn't find Frodo (it's significant that this is only moments after the previous time). At the Cracks of Doom: Frodo claims the Ring for himself and then Sauron becomes aware of him. This is not including an unspecified number of times when Frodo may have worn the Ring between Bilbo's party and the Shadow of the Past. In the above list there are only two times when Sauron is aware of Frodo: the first time is after Frodo explicitly goes looking for Sauron, and the second time is when Frodo is in the heart of Sauron's realm and claims the Ring for his own. He was sitting upon the Seat of Seeing, on Amon Hen, the Hill of the Eye of the Men of Númenor. And that immediately afterwards, when Frodo resolves to leave the Fellowship, he puts the Ring on again without any similar difficulties. This makes it clear that the Hill and Seat of Seeing were an influencing factor in what happened first time round. It should be clear that it's not putting on the Ring that was the main factor here (although it was still a very dangerous thing to do at this particular place), but rather Frodo's claiming of it. The Reason why Sauron doesn't find Bilbo when he puts on the Ring is because putting on the Ring isn't enough for Sauron to find you. Sauron was not effective at finding Frodo; Frodo wore the Ring at least 4 times (out of 6) without Sauron finding him. at Orodruin, in the heart of Sauron's realm, after claiming it for himself. Otherwise Frodo can use the Ring without trouble - in Bombadil's house, at Bree, at the Breaking, and a possible unspecified number of times in the Shire - in just the same manner as Bilbo did. While Sauron's power grew over time, he was not (yet?) powerful enough to locate the Ring. But the Ring was always trying to reach its Master. The power of the Ring waxed and waned. The longer you bore the Ring, the more power it gained over you. The Ring grew in power when it came closer to Mount Doom, the place of its forging. And your motivation mattered: Gollumn was more vulnerable because he started his bearership with Murder. So when Bilbo was the Ringbearer, the Ring was at the ebb of its power. Bilbo had gained the Ring in a game of Riddle, far away from Mount Doom. He used the Ring not to become King of the Shire, but to avoid minor nuisances. So the Ring gained control over Bilbo only slowly. When Frodo bears the Ring during The Fellowship, it is still relatively weak. At Weathertop it even helps Frodo. It is only the leader of the Nine that manages to stand up to the Wielder of the Ring, and only for one stab. During the Two Towers, at Amon Hen, the Ring has grown more dangerous. Here the Ring tempts Frodo to use its power to reach out to Sauron. 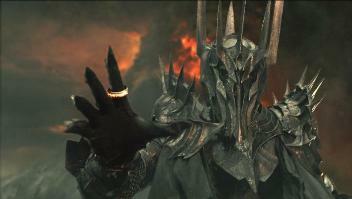 It makes sense that Sauron could feel the Ring reaching out for him. Perhaps it is more surprising that Gandalf noticed Frodo at that time! Gandalf was able to tell Frodo to remove the Ring before it was too late. In the Return of the King, Samwise becomes the Ringbearer for a short time. While the Ring is now very powerful, it still needs time to gain control of its bearer. Samwise uses the Ring to rescue Frodo, and surrenders the ring of his own free will. Samwise's humble motivation weakens the Ring. So Bilbo did have it easier than Frodo. And on close reading Samwise has a tougher job than it appears at first, wearing the Ring in Mordor without falling to its power. Evil has little influence on the plain gardener, who is perhaps the chief hero of the story. In addition, there appears to be an in-universe answer to this. No sooner had he come in sight of Mount Doom, burning far away, than he was aware of a change in his burden. As it drew near the great furnaces where, in the deeps of time, it had been shaped and forged, the Ring’s power grew, and it became more fell, untameable save by some mighty will. As Sam stood there, even though the Ring was not on him but hanging by its chain about his neck, he felt himself enlarged, as if he were robed in a huge distorted shadow of himself, a vast and ominous threat halted upon the walls of Mordor. He felt that he had from now on only two choices: to forbear the Ring, though it would torment him; or to claim it, and challenge the Power that sat in its dark hold beyond the valley of shadows. Already the Ring tempted him, gnawing at his will and reason. ‘He’d spot me and cow me, before I could so much as shout out. He’d spot me, pretty quick, if I put the Ring on now, in Mordor. If I understand this correctly, now that he's in Mordor, wearing the ring will reveal Sam to Sauron's eye. The conclusion is that if a person is not in Mordor wearing the ring would not reveal the wearer to Sauron. In addition the reason for this is also given above, the One Ring grew in power once it was in Mordor. In the 'Breaking of the Fellowship' Frodo is betrayed by Boromir and puts on the One Ring, he is not in Mordor, but once he sees the fortress of Barad-dur, the Eye begins to sense him and It leaped towards him; almost like a finger he felt it, searching for him. Very soon it would nail him down, know just exactly where he was. Clearly the Eye was not able to see him directly but began searching once the Ring was in sight of the dread tower of Mordor. He seemed to be in a world of mist in which there were only shadows: the Ring was upon him. But against Minas Tirith was set another fortress, greater and more strong. Thither, eastward, unwilling his eye was drawn. It passed the ruined bridges of Osgiliath, the grinning gates of Minas Morgul, and the haunted Mountains, and it looked upon Gorgoroth, the valley of terror in the Land of Mordor. Darkness lay there under the Sun. Fire glowed amid the smoke. Mount Doom was burning, and a great reek rising. Then at last his gaze was held: wall upon wall, battlement upon battlement, black, immeasurably strong, mountain of iron, gate of steel, tower of adamant, he saw it: Barad-dûr, Fortress of Sauron. All hope left him. And suddenly he felt the Eye. There was an eye in the Dark Tower that did not sleep. He knew that it had become aware of his gaze. A fierce eager will was there. It leaped towards him; almost like a finger he felt it, searching for him. Very soon it would nail him down, know just exactly where he was. Amon Lhaw it touched. It glanced upon Tol Brandir – he threw himself from the seat, crouching, covering his head with his grey hood. He heard himself crying out: Never, never! Or was it: Verily I come, I come to you? He could not tell. Then as a flash from some other point of power there came to his mind another thought: Take it off ! Take it off ! Fool, take it off ! Take off the Ring! The scene where Suaron immediately 'finds' Frodo when he puts the ring on in Bree exists only in the films; but while it's an invention, it's a good way to visually express a broader idea, that the Ring does not grant invisibility against the more powerful servants of Sauron. 'I was too careless on the hill-top,' answered Strider. 'I was very anxious to find some sign of Gandalf; but it was a mistake for three of us to go up and stand there so long. For the black horses can see, and the Riders can use men and other creatures as spies, as we found at Bree. They themselves do not see the world of light as we do, but our shapes cast shadows in their minds, which only the noon sun destroyed; and in the dark they perceive many signs and forms that are hidden from us: they they are to be most feared. And at all times they smell the blood of living things, desiring and hating it. Senses, too, there are other than sight or smell. We can feel their presence - it troubled our hearts, as soon as we came here, and before we saw them; they feel ours more keenly. Also,' he added, and his voice sank to a whisper, 'the Ring draws them." Later, we see the behaviour of the Nazgul, both before and after Frodo puts on the ring. Over the lip of the little dell, on the side away from the hill, they felt, rather than saw, a shadow rise, one shadow or more than one. They strained their eyes, and the shadows seemed to grow. Soon there could be no doubt: three or four tall black figures were standing there on the slow, looking down on them. So black were they that they seemed like black holes in the deep shade behind them. Frodo thought that he heard a faint hiss as of venomous breath and felt a thin piercing chill. Then the shapes slowly advanced. Immediately [upon putting the Ring on], though everything else remained as before, dim and dark, the shapes became terribly clear. He was able to see beneath their black wrappings...the third was taller than the others...in one hand he held a long sword, and in the other a knife; both the knife and the hand that held it glowed with pale light. He sprang forward and bore down on Frodo. Each time the Nazgul come close to Frodo, he feels the desperate urge to put on the ring. And we see here what happens when he does - he immediately stands out to them, glowing like a beacon, and they go from slow, careful advance to leaping forward to strike him and seize the Ring. So this is what the filmmakers were trying to convey - that putting on the Ring did not hide one from the servants of Sauron, it in fact made you more visible to them, but they still had to be nearby to actually grab you. In the internal logic of the film, though, there are probably several combined reasons for why that happened in Bree but did not happen when Bilbo wore the ring. First, when Bilbo kept the ring, Sauron had no idea where it was. When Bilbo last used it, at his Birthday Party, Sauron had not yet captured Gollum, and did not know that the Ring had been found - he thought it still in Anduin or rolled down to the sea. His eye was not yet turned toward the Shire. Second, once Sauron was aware and looking for the Ring in the Shire, searching from afar, Frodo never put the ring on. In the film, the Prancing Pony was the first time he put the ring on (on screen). Third, the Nazgul were there, in and around Bree, hunting for the ring. They are mindless puppets, slave to their master's will, and at the same time an extension of that will; they were so close that Sauron's presence was stronger than it usually would be. I agree with the comments with regard to proximity to Barad-dur and to presence in Mordor. However the answer depicting the Jackson-esque second age (end of the second age) Sauron as that which Gandalf found in Dol Guldur is incorrect. In Dol Guldur Sauron was a shadow of his former self still regaining power. Also note - Gandalf was never captured in Dol Guldur, in the Books he broke into the dungeons to find Thorins father. 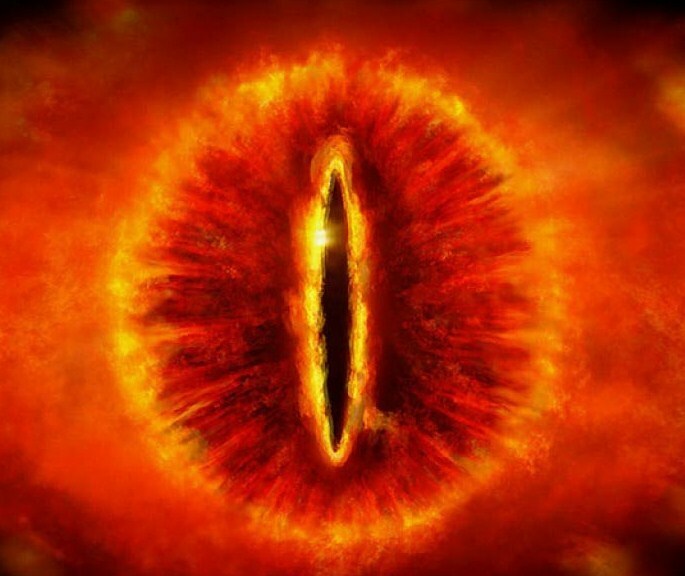 The Sauron 'Eye' was a ringless Sauron (still waiting to gain his full power and physical appearance) and if he regained the Ring he would have regained his former power and would then have returned (we assume) to something similar to the end of the second age depiction. Then he would have been virtually undefeatable based on who was left to fight him in Middle Earth. I also believe the eye described by Tolkien was not meant to be taken as literally as Jackson depicts it, it is essentially a metaphor for the shadowy Sauron searching for the Ring. Sauron may have appeared to some as a burning eye, but not as literally as Jackson shows him. Bilbo found the ring 60 years before the LOTR. At the time, Sauron was the Necromancer, in Dol Gulder. He doesn't even know the ring has been found, until Gollum was brought to Mordor. Sauron was less powerful in the Hobbit, the same reason, why he didn't find Smeagol, when he became Gollum. I have read almost every answer here and have to say the authors are in their own ways all right. Tolkien wrote the Hobbit and LoTR for people to enjoy and to stimulate imagination and debate such as we are engaging in right now. I think that JRR would be elated to know his silly little Hobbits hold such a lasting place in our hearts so long after he has sailed into Valinor upon the elven ships of old before the bending of the seas of Arda. The simple answer would be, Bilbo being he started his ownership of the Ring with pity and used it not for the gaining of power was protected for a time. Frodo knew of the Rings history and power at the beginning of his bearer-ship thanks to Gandalf. So really ignorance of the thing also protected Bilbo. As far as the Eye and it's supposed powers to home in on the wearer, yes and no. Being in Mordor and claiming the Ring in the Cracks of Doom, yes. Outside of Mordor with no motive but to hide from enemies, no, unless you give in and claim it then, yes. Location and motivation as well as the bearer/wearer's inherent native power are also factors. Had Gandalf or Galadrial put on the Ring even with no motive to claim it they would both be as beacons to Saurons Eye. Hobbits are not inherently magically or spiritually powerful beings to begin with so wouldn't be as noticeable. When Sauron knew what he was looking for then he became more attuned to finding Frodo when he had on the Ring. The Ring itself has a part of Sauron himself in it. Kind of like Tom Riddle aka Voldemort and his Snake. One must live while the other survives, and all that. So if a part of Saurons power was being forcibly taken then he would become immediately aware being that his life force was bound up within the Ring. So everyone here has a bit of the right answer. Also, the locations such as Amon Henn did have inherent power as well because of the years that Men of Numenor used it with the palantir. All magically enhanced artifacts like the Ring and palantiri have lasting effects on the people and places they are used by/in. Not the answer you're looking for? Browse other questions tagged the-lord-of-the-rings tolkiens-legendarium the-hobbit the-one-ring or ask your own question. Why was Bilbo not discovered by Sauron during his extended stay with the Wood Elves? Why could Sauron not sense the ring? Was the ring already affecting Frodo by the Council of Elrond? Would Gollum's clothes turn invisible when he wore The One Ring? Why doesn't the “One Ring” make itself impossible to remove?